J has less than 2 weeks of this school year left! And I know some kids are already on school summer holidays…eek! So as I’ve started to get thinking about what we’re going to do over the holidays, I thought now was a good time to share some of our favourite products for helping enable us to get out and stay away from home with our hypotonic and hyperflexible sensory girl! As soon Firefly’s size 2 GoTo Seat was released I ordered one! I loved the look of the size 1 but it was just too small for our tall girl so was really excited by the release of the size 2! At the time J didn’t have a specialist buggy. She has low muscle tone and hyperflexibility, and as she was growing taller it was getting more and more tricky to make sure she had enough support to sit in regular high chairs. We were at the stage of having to leave her sitting low down in her toddler buggy rather than up at the table with friends and family. 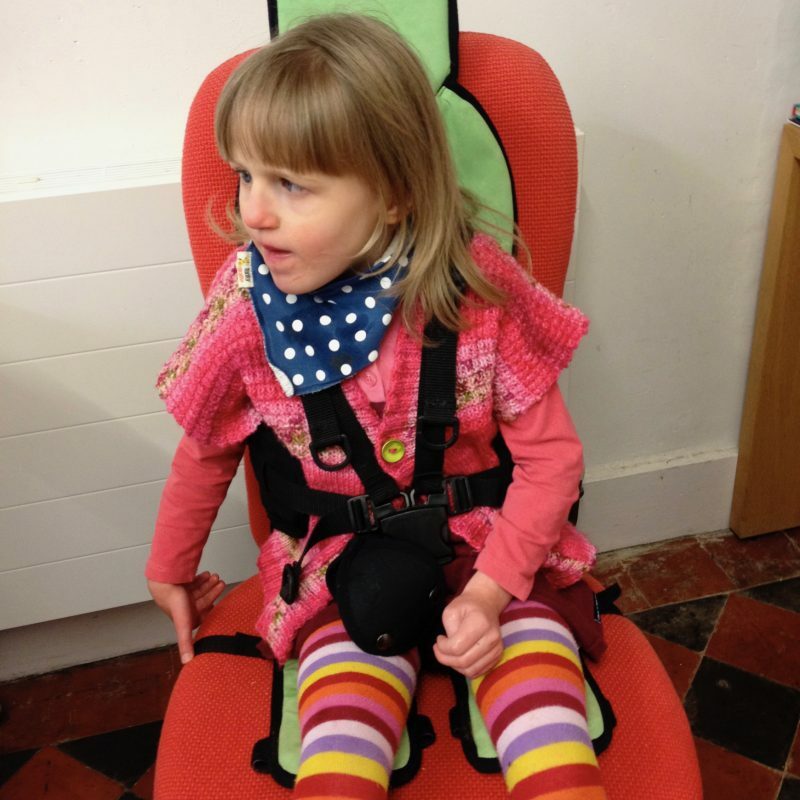 We did find the TotSeat portable high chair useful for a while, but as J’s so tall she was always a little precarious so needed someone on hand at all times! The Goto Seat was a game changer! We use it at grandparents (even now as we tend not to bother bringing her wheelchair into the house as she bum shuffles to get around), on holiday, it’s been amazing at restaurants and cafes (although now she’s older she’ll often sit at the table in her wheelchair). We’ve also used it in toddler swings and in shopping trolleys! We still keep it in the car ready for action wherever we go! J slept in a regular travel cot when away from home for as long as we could still squeeze her in there, actually until her little bro came along and inherited it from her when she was about 3.5. Finding a suitable alternative was tricky (hence why we didn’t for so long!). There are a number of specialist products on the market, but so many of them come with the ‘disability price tag’…. some that would make your eyes water! As always it completely depends on the needs of the individual, but at the age of 3 J didn’t have much mobility but she could roll, so she only needed something that would stop her rolling out! Many people suggested toddler bed guards, or those infallible bed bumpers, but J shuffles and wriggles as well as rolls so even now she’ll find the gap if her mattress isn’t fully surrounded and get stuck or fall out! With a bit of googling we finally found this simple Intex inflatable bed which ticked all our boxes, in a compact package for travelling and at a really reasonable price! It’s essentially a rubber dingy, with high enough sides to stop J rolling out, but has a separate mattress so you can put a standard cotbed sheet on it. We’re still using it 3 years on and have only had 1 or 2 instances where she’s managed to clamber out (go J!). However we’re beginning to wonder what is next! My friend at Don’t Pass the Buck posted this fab looking Genie Care inflatable bed guard for a single bed which might work for us next, although J can now pull herself up to her knees and occasionally her feet, so we’d need to put it on the floor incase of escapes! Continuing with the nighttime theme. We love our Cloud B Twilight Turtle nightlight! 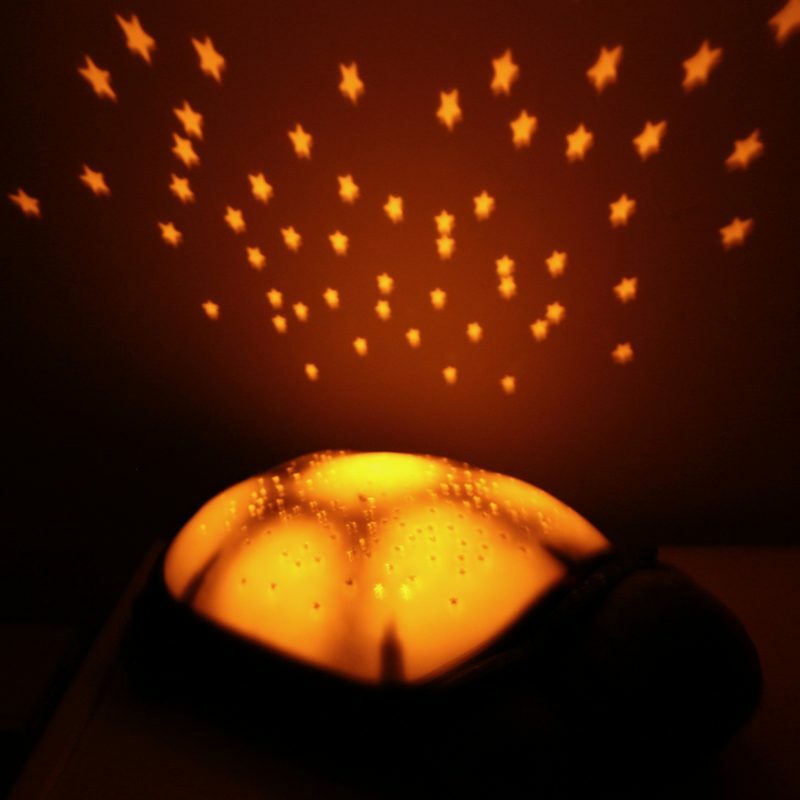 The kids have one in each of their rooms at home and it projects stars, and the moon, onto the ceiling. It’s pretty relaxing to gaze up at from the bed, I’d quite like one myself! We’ve gone for the one with the simple stationary projection, no moving parts or anything to get broken. It’s got nice easy on/off buttons and 3 colour change buttons which W can operate as it switches itself off after 20 minutes. It’s battery operated and lightweight, maybe a little bulky for holidays, but we travel with so much stuff it’s all relative! The key thing about it is that in the dark in a new room it creates a familiarity. A new room, even if you leave a side light on, can be a bit scary to a little one or someone with sensory impairments or anxiety, but the stars make a dark room feel like home. We also tend to bring an iPod with familiar bedtime routine music to help settle both J and W.
This was actually a slight panic buy! J had just been prescribed a new wheelchair which really didn’t suit her. It was heavy to push and not very manoeuvrable, heavy and awkward to lift in and out of the car (we don’t have a WAV) and had absolutely no shock absorption at all, not even air filled tyres to take some of the roughness out of the ride. 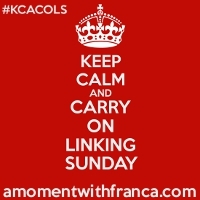 The school summer holidays were coming up and I was beginning to panic that when I was on my own with the kids (i.e. most of the holidays!) we’d be stuck at home! J had had a try in a Delichon Delta buggy at Kidz to Adultz exhibition earlier in the year, and it was amazing! We particularly liked the fact it could hook up as a bike tag-a-long. However our bank account didn’t like the price. After a bit of asking around and googling I found a company called Special Needs Pushchairs, who have a range of buggies made by the same company as Baby Jogger mainstream pushchairs. I had a great chat with the guy over the phone about what we needed and J’s size and support needs, and decided to go for it and order one and it arrived next day delivery! 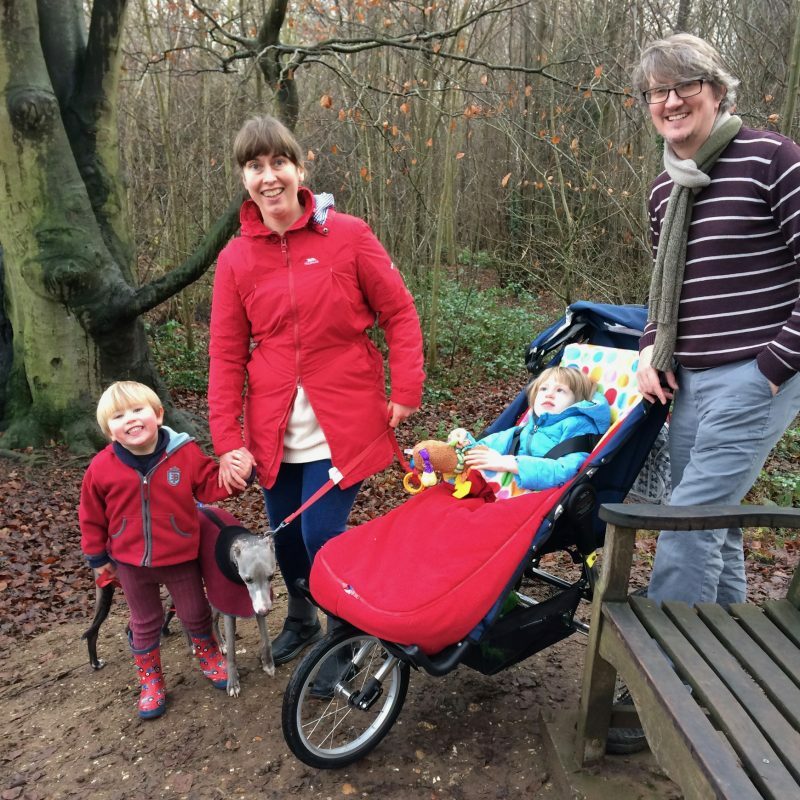 We went for an Advanced Mobility Independence buggy (for ages approx. 5-10). It’s still not cheap, but I felt it was much more consistent with the pricing of high end mainstream prams/buggies and therefore not quite so much of a stretch. We have loved it, and are totally getting our money’s worth! The fixed front wheel takes a bit of getting used to, and it is very long, so it’s not great in confined spaces so I wouldn’t recommend it as an only buggy. We use it for dog walking, at parks and on woodland paths, on firm sand and it’s been brilliant when we’ve been camping! Just a shame it doesn’t hook up as a bike tag-a-long like the Delta does. There’s lots of growing room in it and there’s another size up for older children/teenagers too! And finally, our large changing mat has been invaluable! Whether we find a toilet with a changing bench (a changing places toilet) or not, I still need to take changing bits and bobs (wipes, pads, spare clothes and a change mat). 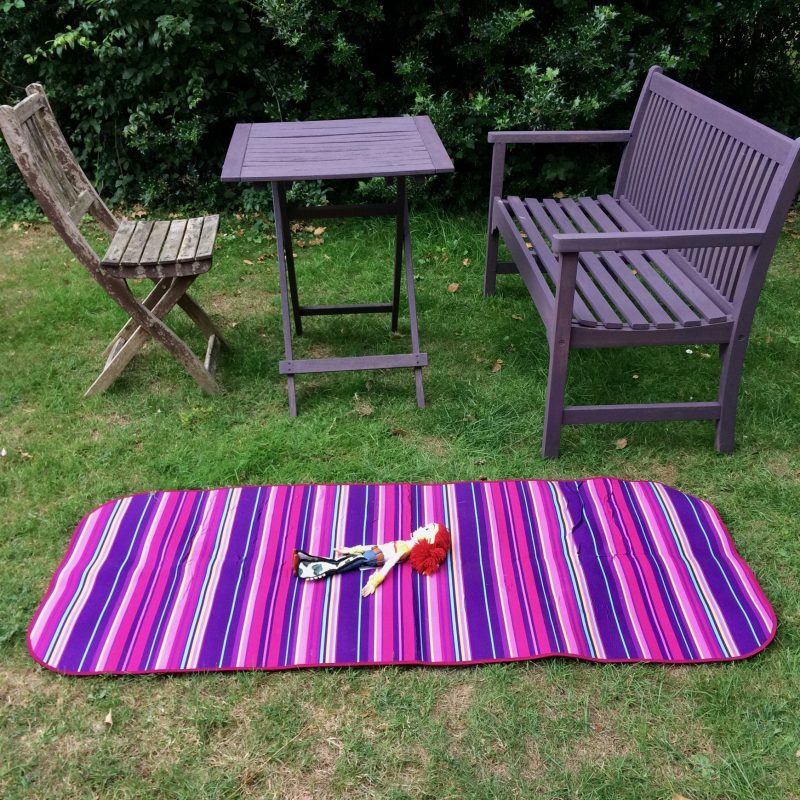 Picnic blankets or yoga mats are quite a popular choice for families who need a bigger changing mat, but I couldn’t be without a machine washable solution, so I jumped at the chance to trial* an early prototype of Care Designs by Bibetta‘s neoprene mat! I love it, and we use it both at home and out and about, as it provides a soft cushioned surface and also gives waterproof and thermal separation from the floor/carpet/bench, and, as I may have already implied, is machine washable! It’s bigger than a baby change mat of course, but no bulkier than the average picnic blanket, so it definitely ticks the boxes for me! It may be a little more pricey than a supermarket picnic blanket, but ours has lasted really well (over a year and still going strong) despite regular washing and being folded up and squished into bags. We’ve also used it as a picnic rug and tent ‘carpet’ when we’ve been camping (after being washed of course!). I am definitely going to get at least one in the larger square size for this summer’s outings! So that’s my Top 5! What are your must haves for holidays and days out? 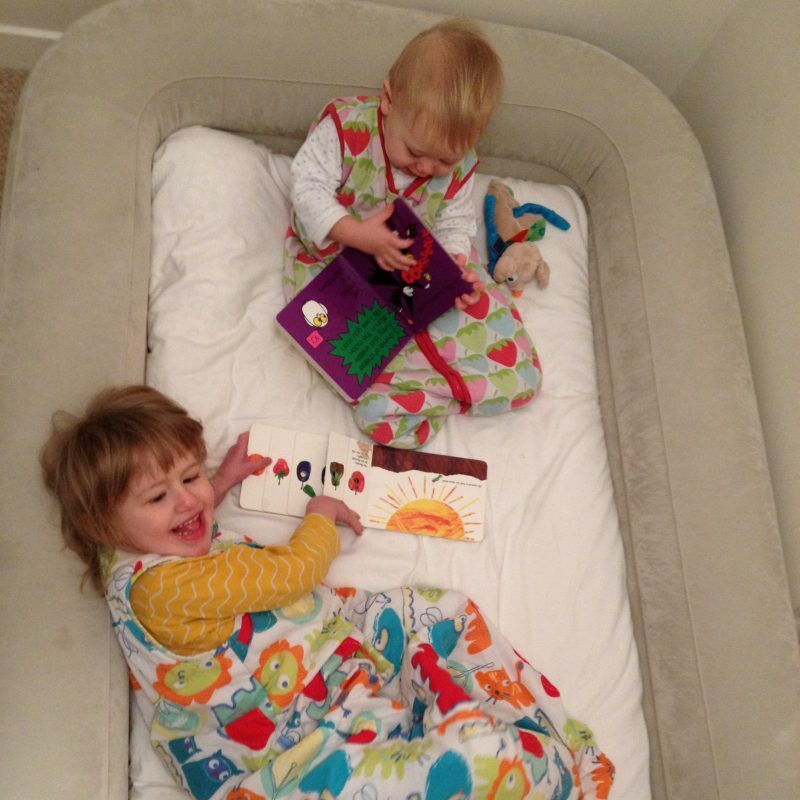 *We were given the prototype changing mat to trial and all other products were our own purchases. Previous Post Inclusive British Standards? Great list I love the travel bed! What a good idea, our day out must have is probably a few small toys so we can have a little break while having a cuppa! Oh yes! Definitely some toys and my 3 year old is quite into colouring at the moment so colouring pens and a little colouring book brings some calm to eating times! Yes I get that! That was another reason for going for the static stars projector as EJ gets really excited by moving lights! I’ve just linked up with #SpectrumSunday and delighted to see your fab post there too 🙂 Such an informative post, I just love the inflatable bed I could really do with one when we go away at the end of August. As I said before I love the offroad buggy! I am a huge fan of these type of buggies and have a similar one for my youngest girly. I also love the projector light, the ones we’ve had haven’t lasted very long, but this one looks like it is much better quality. EJ has the TV remote chewy too! She does love the real TV remote and this one’s a great size with the realistic rubbery raised buttons isn’t it!? Love the fiddle bag idea, must keep that in mind for the future! This is a great list! I need the larger changing mat for sure!! Fab list, I love the travel bed and the night light.